Ricky Ponting has said that he encouraged Rahul Dravid to fight through his struggles and continue playing when their sides met in the two-Test series in India last October. Dravid was going through a lean patch at the time - his only century in 2010 up till then had been against Bangladesh and he managed just one half-century during the series against Australia - but Ponting said he urged Dravid to ignore critics who wrote him off. "I remember after our last series in India there was a lot of talk and speculation about Dravid being finished," Ponting told ESPNcricinfo. "I actually went and found him at the end of the series and said 'don't you even think about retiring' because I just saw some stuff in a few of his innings that suggested he was still a very, very good player. I just said 'don't let them wear you down, don't let them get you down'. I received a similar text message before and after the Ashes from him as well." After that home series against Australia, Dravid scored two centuries against New Zealand before a string of low scores in South Africa. Since then, he has been prolific in tough conditions, with four centuries in seven Tests spread across West Indies and England. In the second of those tours, where England humbled India to claim the No. 1 Test ranking, Dravid was easily India's best batsman, with three centuries and 461 runs over the four Tests. 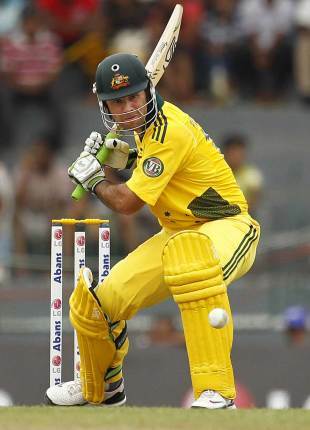 Ponting, 36, has not scored a Test century since January 2010, said it was nice to see the 38-year-old Dravid doing well. He believed players like Dravid were as much an inspiration for senior players like himself, as for youngsters. "There are a few [who provide an inspiration for batsmen of advancing years]. Sachin [Tendulkar] and [Jacques] Kallis both had a great last year; Dravid is doing well now. It's not only good for guys of my age to see guys doing that, it's good for the younger blokes to see it as well; to know that if you keep doing the right things and working hard, and if you've got talent, then age is not a barrier in our game." While young players have role models to look up to, Ponting said he worried that an excess of Twenty20 cricket played at youth level would hinder the development of Test batsmen. "The big worry I've had about Twenty20 cricket and even other shorter forms of the game being played at really developmental times in kids' careers is that it won't teach them the art of concentration. Cricket for me when I was growing up meant batting until someone got me out, and if that took them a week then that's how long it took them. "Now, even Under-17s and Under-19s are playing T20 games in national championships, and at the detriment of two-day games. Good state players these days are averaging 35; if you were averaging 35 when I was playing your dad would go and buy you a basketball or a footy and tell you to play that. So there are areas of concern there; I don't know how you change them." Ponting is one of the few senior members left in what is a transitional Australia team that goes up against Sri Lanka in a three-Test series. He said India, who lost their No. 1 Test ranking in England, could also enter a similar phase once their experienced batsmen retired, but believed their barren bowling reserves were a bigger cause for concern. "India still haven't reached that point that I thought they'd get to yet. They've still got that crux, those great batters in that side. Time will tell with India now. Dravid was probably one who was in the gun before the rest of them and he's found a way to come through. They [Tendulkar, Dravid and VVS Laxman] are all about the same age and they won't go on forever. They will be tested more than anything with their bowlers. I think we found even in the last few years that a lot of their spin bowling probably isn't as strong as it used to be, and if you take Zaheer [Khan] out of their fast bowling stocks there's not much left there either; so they've got an interesting couple of years ahead." India's whitewash in England has led to criticism that there is too much emphasis on the shorter formats of the game in the country, and Ponting, who has not played in the IPL since the end of its first season, said the tournament was affecting India's cricket. "They're probably prioritising Twenty20 cricket as much as anyone aren't they, with the IPL being based there and the commitment some players have to certain franchises and tournaments going on around that. I reckon a good example of where their cricket is now is the fact they played RP Singh in that last Test match, when he hadn't played a first-class game since January. "While India have got the great players they've had they'll remain competitive, but once those guys move on it'll be really interesting for them, and I think South Africa will be exactly the same. Once [Graeme] Smith and Kallis and [Dale] Steyn go out of that team it'll be interesting to see how they rebuild as well."